An underrated gem from earlier in the year, this is a side project with a difference. The Hannes Grossman of the title is the former drummer for such notable names as Obscura and Necrophagist, and this is his first solo album, self-released via crowdfunding. Hannes Grossman performed the drums and guitars here, and does so very well indeed, but is joined by a head-spinningly talented array of guests, including but not limited to solos from Jeff Loomis (ex-Nevermore), Per Nilsson (Scar Symmetry), Christian Münzner (Spawn of Possession), and Ron Jarzombek (Watchtower). Vocals are provided by Morean (Dark Fortress, Noneuclid) and Triptykon's V Santura (who also mixed and mastered the album, with a delicious raw edge that makes all the instruments sound great, even bass). 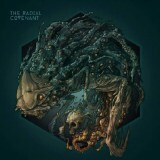 Something for any metalhead to enjoy, then, but what makes The Radial Covenant such a gem is how good the results are. The eight-minute Aeon Illuminate kicks things off to a great start, melodic and intricate guitars given oomph from the blasting backing and the snarled vocals – it's like the best classic melodic death you've ever heard, sped up. It even builds to something of a chorus, Gojira-like in layered grooving, before veering leftfield into prog metal territory with impressive guitar pyrotechnics and solo after solo. And the underlying death metal structure is what keeps it from becoming mere showing-off, each riff and melodic flourish having a purpose, played with a drive and passion for the music that comes over clearly. You'll be in love from the first song, and that's just the beginning. The rhythmic drum pounds that open Alien Utopia herald a turn for the heavier, some speedy death/thrash galloping along gleefully before the song switches gears, spacey synths and gleeful soloing giving it a 90s Pestilence feel. The Sorcerer is slower and darker, an atmospheric Bloodbath-y gloominess emerging from seemingly nowhere, but the band still find time to fit Atheistic jams in and end it in spooky ambience. Grossman's songwriting is terrific, taking in effects-laden soloing and acoustic jams in the same song (Solar Fire Cells) without it feeling odd or forced. Hell, there's even a nearly-six minute instrumental which easily kicks Dream Theater's recent works in the arse, going full thrash towards the end. A slice of prog/tech death metal genius that's well worth your time – and with the recent news that some of the musicians here (including Grossman) are forming a new band, a taste of things to come.